Before :- D.K. Jain, C.J. and Hemant Gupta, J. WITH Civil Misc. No. 18994 of 2004 and Civil Misc Nos. 6907 and 6908 of 2005 in Civil Writ Petition No. 20005 of 2002. For the Petitioners :- Sh. H.S. Mattewal, Sr. Advocate with Sh. Gurminder Singh, Advocate. For the Respondent No. 1 :- Ms. Nirmaljit Kaur, Addl. 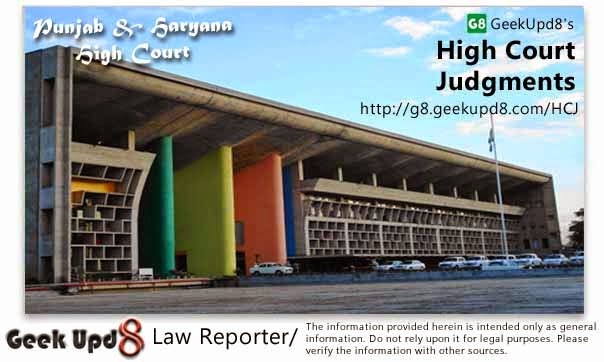 Advocate General, Punjab. For the CBI :- Sh. Rajan Gupta, Advocate. Hemant Gupta, J. - This order shall dispose of Civil Miscellaneous Nos. 18993 of 2003 and 6907 of 2005 whereby the applicants have sought to be impleaded as respondents in the above-mentioned writ petition and Civil Miscellaneous Nos. 18994 of 2003 and 6908 of 2005 for recall and modification of the order passed on 30.4.2003 allegedly directing the State Government to issue notification for handing over the case to the Central Bureau of Investigation (hereinafter to be referred as "the CBI") with further prayer to set aside the notification dated 2.5.2003 and the First Information Report registered in pursuance of such notification by the CBI. 2. The present writ petition was filed by some of the candidates who were appointed to the post of Panchayat Secretaries. The posts of Panchayat Secretaries exist under the Punjab Panchayati Raj Act, 1994 (hereinafter referred to as "the Act"). Section 26 of the Act provides that the State Government by notification may constitute the Punjab Panchayat Secretaries Service. In pursuance of the directions of this Court in CWP No. 9835 of 1996 titled Palvinder Singh v. State of Punjab, selection to 190 posts of Panchayat Secretaries was ordered to be finalised before 20.11.1996. The said posts were advertised in the year 1992. Another advertisement was issued for filling up 800 posts of the Panchayat Secretaries on 14.10.1996. Another advertisement was issued on 17/18.9.1996 for filling up 700 posts of Panchayat Secretaries. It was clarified that the candidates who had applied earlier need not apply again. By way of another advertisement dated 19.9.1998, applications were called for the posts advertised from female candidates. In response to such advertisements, over one lac fifty thousand candidates submitted their applications for appointment. "The Bench Secretary is directed to give copy of this order to learned Deputy Advocate General who shall forward the same to the Advocate General, Punjab. The Advocate-General, Punjab, shall send the copy of the order to the Chief Secretary, Punjab, who shall ensure that a thorough probe is conducted into the selections made by the Directorate of Department of Rural Development and Panchayats by an officer not below the rank of Secretary to the Government. After conducting the probe, the report be produced before the Court within a period of 8 weeks. The desirability of issuing other directions would be considered by the Court after examining the report". 4. On 10.12.2002, the State Government declared the entire selection of Panchayat Secretaries held during the year 1996-2001 as null and void and the appointment of the petitioners amongst all other over 900 candidates was cancelled. The said order is subject-matter of challenge in the present writ petition. "The sealed cover in which the report was sent by the Chief Secretary, Punjab, was opened in the presence of the learned counsel for the petitioner and the learned Additional Advocate General. After having carefully gone through the report, we direct learned Additional Advocate General to get in touch with the concerned authorities of the State Government and make a statement tomorrow as to what action the Government is contemplating on the inquiry report. The State Government will have the option of suo-moto making further investigation by removing all those named in the report from their respective offices so as to ensure that the further enquiry is not influenced by any of those officers. It may also order a CBI probe into the entire scandal involving appointment of Panchayat Secretaries. Learned Additional Advocate General should also make a statement about the Government's decision to fix the responsibility of the officers named in the report. The Bench Secretary is directed to re-seal the report and place the same before the Court tomorrow. "In the light of the order made yesterday, learned Additional Advocate General, after seeking instructions from the Chief Secretary, Punjab, made a statement that State Government has decided to hand over the investigation of the scandal involving selection of Panchayat Secretaries to the Central Bureau of Investigation and also to take action against the officers named in enquiry report. She requests for ten days time to enable the Government to file an affidavit to this effect. Adjourned to 15.11.2002 for further consideration. The required affidavit be filed on or before 13.11.2002. The sealed envelope containing the report by the Chief Secretary be returned to the Additional Advocate General for being forwarded to the concerned authority." 7. As per the report submitted, Shri Nirmal Singh Kahlon, the then Rural Development and Panchayats Minister, Punjab, applicant in CM No. 6907 of 2005; Shri Mandeep Singh, IAS, the then Director, Rural Development and Panchayats; and all Chairmen and members of the Selection Committees, some of the applicants in CM No. 18993 of 2002, were found responsible for the tainted selection of 909 Panchayat Secretaries. It was found that the selection of Panchayat Secretaries was highly tainted and full of irregularities. On the basis of such facts, State Government declared null and void the selection of 909 Panchayat Secretaries made during the year 1996-2001 and appointments made thereto vide order dated 10.12.2002. It was pointed out in the written statement that the State Government has suspended 12 officers who had worked as Chairmen and members of the four Selection Committees, appropriate disciplinary action had been initiated against Shri Mandeep Singh, IAS, the then Director, Rural Development and Panchayats and another IAS Officer. For initiating action against Shri N.S. Kahlon, the then Rural Development and Panchayat Minister, appropriate steps have been initiated by the Chief Secretary. "Having heard Shri Rajan Gupta, learned counsel for CBI (respondent No. 5 in CWP 4283/2002) it prima facie, appears to us that CBI has not been apprised of full facts as well as various orders passed by this Court from time to time, including those in CWP No. 5283/2002, accordingly, we direct our office to hand over a copy of various orders passed in that Writ Petition as well as in the instant one to Shri Rajan Gupta, learned counsel for CBI by tomorrow. In regard to one of submissions made by Shri Rajan Gupta, learned counsel that no notification has been made by the Punjab Government handling over the investigation to the CBI, we hope and trust that necessary notification in that regard will be published by the Punjab Government within couple of days. Let a copy of this order be handed over to Mr. Rajan Gupta, learned counsel for CBI by tomorrow for its intimation to and follow up action. Let a copy of this order be also handed over to Mrs. Nirmaljit Kaur, Additional Advocate General, Punjab, by tomorrow for its intimation to and follow up action." "Having regard to the peculiar facts and circumstances of the instant case, it was the Court which took a view earlier that matter is such, which requires, in the interest of justice, investigation by the Central Bureau of Investigation and then the State of Punjab came up nearly agreeing to the observations made by the Court, though after sometime the Court noticed some dilly-dallying on the part of the State Government but ultimately it decided to hand over the investigation to the CBI. We reiterate that in the peculiar facts and circumstances investigation by Central Bureau of Investigation appears to be not only just and proper but a necessity. Accordingly, we hope and trust that the Central Bureau of Investigation will rise to the occasion and do its best to investigate and book the real culprits. We expect that Central Bureau of Investigation will do its investigation within a reasonable time though we appreciate the limited resources, which it is having. We are sure that if the Director of Central Bureau of Investigation moves the Government of India to provide more funds and/or officers, it will consider the request, if so made, objectively and a suitable decision will be taken by the Government of India." 10. Thereafter, the Court has sought status report from the CBI from time to time. 11. The applicants in CM No. 18993 of 2003 and CM No. 6907 of 2005 have sought recall, modification and quashing of the order dated 30.4.2003 passed in the present writ petition, inter alia, on the ground that in compliance with the observations made by this Court, the State Government has issued a notification dated 2.5.2003 directing the CBI to enquire into the recruitment of Panchayat Secretaries. FIR No. 8(s) of 2003 dated 26.6.2002 was registered by the CBI on the basis of complaint made by the Director, Rural Development and Panchayats. It was alleged that the said order has been obtained by the State of Punjab by suppressing the fact that an FIR has already been registered by the Vigilance Department on the same allegations with respect to the recruitment of Panchayat Secretaries and a report under Section 172(2) of the Code of Criminal Procedure, 1973 (hereinafter to be referred as "the Code") in the said FIR has also been submitted before the competent Court. It was submitted that FIR No. 13 dated 14.6.2003 under Sections 420/467/468/120-B read with Section 13(2) of the Prevention of Corruption Act, 1988, was registered at the Police Station, Vigilance Bureau, Flying Squad Punjab at Mohali. The charge-sheet has been filed against Shri Nirmal Singh Kahlon, the then Minister of Rural Development and Panchayats; Shri J.P. Singla, one of the applicants herein. Messrs Joginder Singh, Pradeep Kaleka and C.L. Premy, the other applications, witnesses in the aforesaid FIR, now have been made co-accused in the FIR registered by the CBI. It has been alleged that no fresh enquiry can be ordered by this court and further enquiry cannot be instituted by another agency or by an order of the State Government in view of an earlier FIR. It was pointed out that since the police has already submitted final report under Section 173 of the Code, therefore, institution of another FIR for the same offence is barred in view of Section 154 of the Code. 12. The allegations in FIR No. 13 dated 14.6.2002 registered at Police Station Vigilance Bureau, SAS Nagar, Mohali, are to the effect that Shri Nirmal Singh Kahlon, Ex-Minister, Rural Development and Panchayats, during his tenure has made recruitment to the various posts of Tax Collector, Patwaris, Peons and Clerks etc. The favourites, who were not fulfilling the requirement like age, qualification, were made Panchayat Secretaries by manipulating the marks in the answer sheet. Reference was made to the candidature of Ms. Kamalpreet Kaur, who though fulfilled the basic qualifications in handicap quota for the "Mukh Sewak" was sidelined as Rs. 3 lacs were demanded from her by sending Manjeet Singh, Steno, Office of Rural Development and Panchayats, to her residence. Shri Nirmal Singh Kahlon and Shri J.P. Singla are the two accused in the report under Section 173 of the Code. The applicants have also appended communication dated April 2, 2003 (Annexure P-13) from the Director, Central Bureau of Investigation, to the Chief Secretary to Government of Punjab. The said communication is in response to the D.O. letter dated 4.3.2003 by the Chief Secretary to the Government of Punjab requesting for investigation into irregularities committed in the selection of Panchayat Secretaries based on the enquiry report of Shri P. Ram, IAS. As mentioned above, the CBI has conveyed its reluctance to take up the investigation of the scandal. In the reply filed on behalf of the State Government, reference was made to the orders passed by this Court in CWP No. 5293 of 2002 on 31.10.2002, 1.11.2002, 15.11.2002, 10.2.2003 and 12.2.2003. The orders dated 31.10.2002 and 1.11.2002 have been reproduced above. In order dated 15.11.2002, the State Government has sought time to file an affidavit indicating its stand on the enquiry by the CBI into the recruitment scandal and its decision to fix responsibility of those named in the report shown to the Court. A perusal of the order passed on 10.2.2003 shows that the affidavit of the Chief Secretary was filed but the matter was adjourned for further hearing so that the learned State counsel could have further instructions in regard to the statement made by her earlier. A copy of the affidavit dated 5.2.2003 filed on behalf of Shri Y.S. Ratra, Chief Secretary to the Government of Punjab has been appended as Annexure R-16. In the said affidavit, it was pointed out that the matter has been referred to the department of Home Affairs and Justice in order to have the matter thoroughly investigated from the Crime Branch of the Home Department. It was also pointed out in the said affidavit that an FIR No. 13 dated 14.6.2002 under Sections 420, 467, 468, 120-B IPC and 13(1)(d)(e) read with Section 13(2) of Prevention of Corruption Act, 1988, at Police Station Vigilance Bureau, Phase-I, Mohali, Punjab, has been registered against Shri Nirmal Singh Kahlon, the then Minister of Rural Development and Panchayats, along with some other departmental officers by the Vigilance Bureau of the State. The irregularities committed in the selection of the Panchayat Secretaries is one of the many issues reported in the said FIR. 13. Learned counsel for the applicants has vehemently argued that once a report under Section 173 of the Code has been filed before a competent Court arising out of an FIR containing allegations of improper selection of Panchayat Secretaries, this Court could not order investigation into the same set of allegations by the CBI. It was argued that the factum of an FIR earlier recorded by the Vigilance Bureau, Punjab, and the report submitted by such Vigilance Bureau to the competent Court was withheld from this Court. Therefore, the order of this Court dated 30.4.2003 impliedly directing the State Government to hand over investigation into the allegations to CBI, was without jurisdiction and not sustainable in law. It is argued that had the fact of the previous FIR been in the knowledge of the Court, the result would have been different. Therefore, order dated 30.4.2003 requires to be recalled and modified. Learned counsel for the applicants has also placed reliance on the decision of the Supreme Court reported as T.T. Antony v. State of Kerala and others, 2001(6) SCC 181, to contend that there could not be a second FIR and investigation into the same set of allegations which form subject-matter of earlier FIR which culminated into report under Section 173 of the Code. Learned counsel for the applicants has also placed reliance on the decision reported as Kari Choudhary v. Mst. Sita Devi and others, 2002(1) R.C.R. (Criminal) 86 : 2002(1) SCC 714, to contend that there cannot be two FIRs against the same accused in respect of same case. It was also argued that the affidavit dated 5.2.2003 of the Chief Secretary has not been filed before this Court. 14. On the other hand, learned State Counsel has vehemently argued that in pursuance of the directions of this Court dated 3.4.2002, the matter was enquired into by an officer of the State Government, namely, Shri P. Ram, IAS. The enquiry report dated 25.7.2002, Annexure R-1, refers to many irregularities and illegalities. The FIR was lodged by the Vigilance Bureau, Punjab, on 14.6.2002, i.e. after the orders of enquiry were passed by this Court on 3.4.2002. The report under Section 173 of the Code has been filed on 19.9.2002 after the receipt of the report by Shri P. Ram, IAS, on 24.7.2002. It is pointed out that the FIR lodged by the CBI is not a fresh FIR only because it is so titled but, in fact, is an order of further investigation into the entire scandal of appointment of Panchayat Secretaries in exercise of the powers vested in the investigating agency under Section 173(8) of the Code. It is argued that mere title is not determinative of the fact whether it is a fresh FIR on the same set of allegations or is further investigation arising out of the earlier FIR. In fact, a statement was made before this Court on 1.11.2002 to hand over the investigation to the CBI. It is further argued that the Chief Secretary to Government of Punjab had requested on 4.3.2003 to hand over the investigation to the CBI. In fact, CBI was reluctant to take over the investigation which is evident from the letter dated 2.5.2003, Annexure P-13, attached with the affidavit. Since the decision has already been taken to hand over further investigation into the entire scandal of appointment of Panchayat Secretaries, necessary notification was published by the State Government on 2.5.2003. With such notification having been published, it became mandatory for the CBI to take up the investigation into the entire scandal. It is submitted that there were no directions in order dated 30.4.2003, the prayer for recall or modification of which has been made by the applicants. Reliance was placed on the decision as Ram Lal Narang v. State (Delhi Administration), 1979(2) SCC 322 and Upkar Singh v. Ved Parkash and others, AIR 2004 SC 4320. 15. On the other hand, learned counsel representing the CBI, assisting the Court, raised an argument that transfer of investigation in pursuance of the provisions under Section 6 of the Delhi Special Police Establishment Act, 1946, is not a second FIR into the same set of allegations. The FIR by the CBI is recorded to enable its investigating officers to set the process of investigation into motion. Reliance is placed on a decision of the Supreme Court reported as Central Bureau of Investigation v. Rajesh Gandhi and another, 1996(11) SCC 253, to contend that the accused has no right to claim an opportunity of hearing before handing over investigation to CBI. The accused also has no right as to which investigating agency should conduct investigation into the allegations against the accused. Reliance is also placed on the decision reported as Upkar Singh v. Ved Parkash and others, 2004(4) RCR(Crl.) 294 : AIR 2002 SC 4320, to submit that the judgment of the Supreme Court in T.T. Antony's case (supra) stands impliedly overruled to the extent it was held that another FIR on the same set of allegations cannot be lodged. 16. We have heard learned counsel for the parties at great length. The facts which emerge out of the respective contentions of the parties are that in pursuance of the directions of this Court dated 3.4.2002 in CWP No. 5283 of 2002, Shri P. Ram, IAS, submitted an enquiry report dated 24.7.2002 pointing out various illegalities and irregularities. Prior to the said enquiry report, an FIR No. 13 dated 14.6.2002 was lodged by the Vigilance Bureau. Report under Section 173 of the Code was filed before the Court on 19.9.2002. On 1.11.2002, learned State counsel had made a statement of the intention of the State Government to hand over the investigation to the CBI. On 4.3.2003, a letter was written by the Chief Secretary to the Punjab Government to the CBI to take over the investigation but the notification mandating the CBI was published only on 2.5.2003. Therefore, the argument that the CBI was directed to take over the investigation by this Court on 30.4.2003 is not borne out from the record. On the said date, the Court expressed hope that the State Government will take necessary steps to hand over the investigation to CBI. Therefore, we do not find any substance in the argument that this Court had directed the CBI to take over the investigation. Since there is no direction, the applicants cannot seek any recall or modification of the said order dated 30.4.2003. 17. The argument that the Court was not informed of an earlier FIR No. 13 dated 14.6.2002 is not borne out from the record. An affidavit of the Chief Secretary dated 5.2.2003 has been appended as Annexure R-16 with the reply filed by the State Government. The reference of filing of affidavit find mention in the order dated 10.2.2003. There is reference to the previous FIR in the replication filed by the petitioners in CWP No. 5283 of 2002. Therefore, the argument that the Court was not aware of the investigation by the Vigilance Bureau is not made out. 18. The questions which arise for consideration of this Court are whether the investigation by CBI is, in fact, further investigation within the meaning of Section 173(8) of the Code and whether such investigation can be carried out by CBI without the permission of the Court, which has already taken cognizance of report submitted under Section 17392) of the Code. "(8) Nothing in this section shall be deemed to preclude further investigation in respect of an offence after a report under sub-section (2) has been forwarded to the Magistrate and, where upon such investigation, the officer-in-charge of the police station obtains further evidence, oral or documentary, he shall forward to the Magistrate a further report or reports regarding such evidence in the form prescribed; and the provisions of sub- sections (2) to (6) shall, as far as may be, apply in relation to such report or reports as they apply in relation to a report forwarded under sub-section (2)". ".... Similarly, where the involvement of persons who are not already accused comes to the notice of the investigating agency, the investigating agency cannot keep quiet and refuse to investigate the fresh information. It is their duty to investigate and submit a report to the Magistrate upon the involvement of the other persons. In either case, it is for the Magistrate to decide upon his future course of action depending upon the stage at which the case is before him. If he has already taken cognizance of the offence, but has not proceeded with the enquiry or trial, he may direct the issue of process to persons freshly discovered to be involved and deal with all the accused in a single enquiry or trial. If the case of which he has previously taken cognizance has already proceeded to some extent, he may take fresh cognizance of the offence of the offence disclosed against the newly involved accused and proceed with the case as a separate case. What action a Magistrate is to take in accordance with the provisions of the Cr.P.C. in such situations is a matter best left to the discretion of the Magistrate". 20. The Court concluded that in the interests of independence of the Magistracy and judiciary, in the interests of purity of administration of criminal justice and in the interests of the comity of the various agencies and institutions entrusted with different stages of said administration, it would ordinarily be desirable that the police should inform the Court and seek formal permission to make further investigation when fresh facts come to light. "19. The scheme of Cr.P.C. is that an officer-in-charge of a police station has to commence investigation as provided in Section 156 or 157 Cr.P.C. on the basis of entry of the first information report, on coming to know of the commission of a cognizable offence. On completion of investigation and on the basis of the evidence collected, he has to form an opinion under Section 169 or 170 Cr.P.C., as the case may be, and forward his report to the Magistrate concerned under Section 173(2) Cr.P.C. However, even after filing such a report, if he comes into possession of further information or material, he need not register a fresh FIR; he is empowered to make further investigation, normally with the leave of the Court, and where during further investigation he collects further evidence, oral or documentary, he is obliged to forward the same with one or more further reports; this is the import of sub-section (8) of Section 173 Cr.P.C." "In our view a case of fresh investigation based on the second or successive FIRs, not being a counter-case, filed in connection with the same or connected cognizable offence alleged to have been committed in the course of the same transaction and in respect of which pursuant to the first FIR either investigation is under way or final report under Section 173(2) has been forwarded to the Magistrate, may be a fit case for exercise of power under Section 482 Cr.P.C. or under Articles 226/227 of the Constitution". "35. For the aforementioned reasons, the registration of the second FIR under Section 154 Cr.P.C. on the basis of the letter of the Director General of Police as Crime No. 268 of 1997 of Kuthuparamba Police Station is not valid and consequently the investigation made pursuant thereto is of no legal consequence, they are accordingly quashed. We hasten to add that this does not preclude the investigating agency from seeking leave of the Court in Crime Nos. 353 and 354 of 1994 for making further investigations and filing a further report or reports under Section 173(8) Cr.P.C. before the competent Magistrate in the said cases. In this view of the matter, we are not inclined to interfere with the judgment of the High Court under challenge insofar as it relates to quashing of Crime No. 268 of 1997 of Kuthuparamba Police Station against the SP (R.A. Chandrasekhar); in all other aspects the impugned judgment of the High Court shall stand set aside." 24. The correctness of the view rendered in T.T. Antony's case (supra), became subject-matter of consideration in Upkar Singh's case (supra), wherein it was found that T.T. Antony's case is not applicable in respect of a counter complaint by the accused in the first complaint or in his behalf alleging a different version of the said incident. "11. Learned counsel adopted an alternative contention that once the proceedings initiated under FIR No. 135 ended in a final report the police had no authority to register a second FIR and number it as FIR No. 208. Of course the legal position is that there cannot be two FIRs against the same accused in respect of the same case. But when there are rival versions in respect of the same episode, they would normally take the shape of two different FIRs and investigation can be carried on under both of them by the same investigating agency. Even that apart, the report submitted to the court styling it as FIR No. 208 of 1998 need be considered as an information submitted to the Court regarding the new discovery made by the police during investigation that persons not named in FIR No. 135 are the real culprits. To quash the said proceedings merely on the ground that final report had been laid in FIR No. 135 is, to say the least, too technical. The ultimate object of every investigation is to find out whether the offences alleged have been committed and, if so, who have committed it. 12. Even otherwise, the investigating agency is not precluded from further investigation in respect of an offence in spite of forwarding a report under sub-section (2) of Section 173 on a previous occasion. This is clear from Section 173(8) of the Code". 26. In Central Bureau of Investigation v. R.S. Pai, 2002(2) R.C.R. (Criminal) 536 : AIR 2002 SC 1644, it has been held that further investigation, if called for, is not precluded even after charge-sheet is submitted under Section 173(8) of the Code. Similarly, in Zahira Habilulla H. Sheikh v. State of Gujarat, 2004(2) R.C.R. (Criminal) 836 : 2004(3) Apex Criminal 46 : 2004(4) SCC 158 and Hasanbhai Valibhai Qureshi v. State of Gujarat, 2004(2) R.C.R. (Criminal) 463 : 2004(2) Apex Criminal 609 : 2004(5) SCC 347, it has been held that sub-section (8) of Section 173 of the Code permits further investigation and even de hors any direction from the Court as such. It is open to the police to conduct proper investigation even if the Court took cognizance of any offence on the strength of the police report earlier submitted. 27. On the basis of the aforesaid judgments, one can safely draw a conclusion that second FIR on the same set of allegations, not being a counter case, cannot be lodged but the investigating agency has right to make further investigation even after report under Section 173(2) of the Code is filed before the Court. In Ram Lal Narang's case (supra), Hon'ble Supreme Court has held that it would ordinarily be desirable that the police should inform the Court and seek formal permission to make over investigation when fresh facts come to light. Similar is the view in T.T. Antony's case (supra) wherein liberty was given to the investigating agency to seek leave of the Court in making further investigation and filing further report or reports under Section 173(8) of the Code. "9. The question then requires to be considered whether and to what extent the trial which follows such investigation is vitiated. Now, trial follows cognizance and cognizance is preceded by investigation. This is undoubtedly the basic scheme of the Code in respect of cognizable cases. But it does not necessarily follow that an invalid investigation nullifies the cognizance or trial based thereon. Here we are not concerned with the effect of the breach of a mandatory provision regulating the competence or procedure of the Court as regards cognizance or trial. It is only with reference to such a breach that the question as to whether it constitutes an illegality vitiating the proceedings or a mere irregularity arises. A defect or illegality in investigation, however serious, has no direct bearing on the competence or the procedure relating to cognizance or trial. No doubt a police report which results from an investigation is provided in Section 190 of the Code of Criminal Procedure as the material on which cognizance is taken. But it cannot be maintained that a valid and legal police report is the foundation of the jurisdiction of the Court to take cognizance. Section 190 of the Code of Criminal Procedure is one out of a group of sections under the heading 'Conditions requisite for initiation of proceedings'. The language of this section is in marked contrast with that of the other sections of the group under the same heading i.e. Sections 193 and 195 to 199. These latter sections regulate the competence of the Court and bar its jurisdiction in certain cases excepting in compliance therewith. But Section 190 does not. While no doubt, in one sense, clauses (a), (b) and (c) of Section 190(1) are conditions requisite for taking of cognizance, it is not possible to say that cognizance on an invalid police report is prohibited and is therefore a nullity. Such an invalid report may still fall either under clause (a) or (b) of Section 190(1), (whether it is the one or the other we need not pause to consider) and in any case cognizance so taken is only in the nature of error in a proceeding antecedent to the trial." The Court after referring to Parbhu v. Emperor, AIR 1944 Privy Council 73 and Lumbhardar Zutshi v. R., AIR 1950 Privy Council 26, held that if cognizance is in fact taken on a police report initiated by the breach of a mandatory provision relating to investigation, there can be no doubt that the result of the trial, which follows it cannot be set aside unless the illegality in the investigation can be shown to have brought about a miscarriage of justice and that an illegality committed in the course of investigation does not affect the competence and the jurisdiction of the court for trial. This being the legal position, even assuming for the sake of argument that CBI committed an error or irregularity in submitting the charge-sheet without the approval of CVC, the cognizance taken by the learned Special Judge on the basis of such a charge-sheet could not be set aside nor could further proceedings in pursuance thereof be quashed. The High Court has clearly erred in setting aside the order of the learned Special Judge taking cognizance of the offence and in quashing further proceedings of the case". 29. Admittedly, the CBI in pursuance of the notifications has yet not submitted the final report. Therefore, we are inclined to accept the stand of the respondents that though the CBI has registered an FIR but, in fact, in substance it is further investigation arising out of the FIR lodged earlier by the Vigilance Bureau, Punjab. One has to go by the substance of the allegations and all the attending circumstances thereto and not the mere title. The FIR recorded by the CBI is nothing but in fact a step in aid to take up further investigation at the instance of the State Government in respect of the FIR recorded by the Vigilance Bureau earlier. It is well settled that nomenclature of the document is not conclusive to determine the nature of the document. If the circumstances leading to the notification published by the State Government and subsequent investigations by the CBI are taken into consideration, it will leave no manner of doubt that, in fact, CBI has taken up investigation into the entire scandal of recruitment of 909 Panchayat Secretaries. Such investigations are stated to be almost complete. Therefore, we find that, in fact, it is not a case of fresh FIR on the same allegations but a case of further investigation by the CBI as authorised by the State Government vide notification dated 2.5.2003. Therefore, we are of the opinion that the investigations entrusted to the CBI by the State Government are, in fact, further investigations in terms of the provisions of Section 173(8) of the Code. "(o) "officer-in-charge of a police station" includes, when the officer-in- charge of the police station is absent from the station-house or unable from illness or other cause to perform his duties, the police officer present at the station-house who is next in rank to such officer and is above the rank of constable or, when the State Government so directs, as other police officer so present;"
"36. Powers of superior officers of police. - Police Officers superior in rank to an officer-in-charge of a police station may exercise the same powers, throughout the local area to which they are appointed, as may be exercised by such officer within the limits of his station". ".... Sub-section (8) of Section 173 is not the source of power of the State Government to direct further investigation. Section 173(8) enables an officer-in-charge of a police station to carry on further investigation even after a report under Section 173(2) is submitted to Court. But if State Government has otherwise power to direct further investigation it is neither curtailed, limited nor denied by Section 173(8), more so, when the State Government directs an officer superior in rank to an officer-in-charge of police station thereby enjoying all powers of an officer-in-charge of a police station to further investigate the case. Such a situation would be covered by the combined reading of Section 173(8) with Section 36 of the Code. Such power is claimed a flowing from the power of superintendence over police to direct a police officer to do or not to do a certain thing because at the stage of investigation the power is enjoyed as executive power untrammelled by the judiciary." "18. There is no warrant for invoking this principle because Section 5 of the Code provides that nothing in the Code shall, in the absence of a specific provision to the contrary, effect any special or local law for the time being in force, or any special jurisdiction or power conferred, or any special form of procedure prescribed, by any other law for the time being in force. Section 3 of the Act does not prescribed any special procedure for investigation contrary to one prescribed in the Code. It merely provides for conferment of certain power which, when exercised, would project into the provisions of the Code which confers power on the officer-in-charge of a police station to carry on further investigation under Section 173(8) after submission of a report and that too without any permission of the Magistrate. There is no conflict between the two provisions. Power to direct investigation or further investigation is entirely different from the method and procedure of investigation and the competence of the person to investigate. Section 3 of the Act as interpreted by us deals with the powers of the State Government to direct further investigation into the case. Undoubtedly, such direction will be given to a person competent to investigate the offence and as has been pointed out, the police officer in rank superior to the police officer in charge of the police station, to wit, Inspector General, Vigilance, has been directed to carry on further investigation. An officer superior in rank to an officer-in-charge of a police station could as well exercise the power of further investigation under Section 173(8) in view of the provision embodied in Section 36 of the Code. If that be so, such superior officer could as well undertake further investigation on his own and it is immaterial and irrelevant that he does it at the instance or on the direction of the State Government. Such a direction in no way corrodes his power to further investigate on his own". 33. In view of the above discussion, we are of the opinion that entrustment of investigations to the CBI is, in fact, entrustment of investigations by the State to a police officer superior in rank competent to submit report as an officer-in-charge of the Police Station. 34. It may be noticed that in Rajesh Gandhi's case (supra), it has been held that the decision to investigate or the decision on the agency which should investigate does not attract principles of natural justice. The accused cannot have a say in who should investigate the offence he is charged with nor is there any provision in law under which, while granting consent or extending the powers and jurisdiction of the Delhi Special Police Establishment to the specified State and to any specified case, any reasons are required to be recorded on the face of the notification. The reasons cannot be shown independently. If the investigation by the local police is not satisfactory, a further investigation is not precluded. 35. Thus, we find that further investigations being carried out by the CBI are not liable to be quashed at the instance of the applicants. Thus, Civil Miscellaneous Nos. 18993, 18994 of 2004, 6907 and 6908 of 2005 are dismissed with costs. No orders are called for in view of the order of even date in another application. In view of the detailed order passed separately, present civil miscellaneous petition is dismissed having been rendered infructuous.